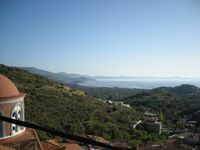 Properties in Chios average 4.5 out of 5 stars. An Excellent and Comfortable resort at the heart of Chios most trendy beach!! Property 34: An Excellent and Comfortable resort at the heart of Chios most trendy beach!! St. George Sykoussis traditional residence - Agios Georgios Sykousis Chios, Gr. 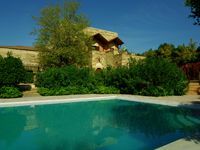 Property 48: St. George Sykoussis traditional residence - Agios Georgios Sykousis Chios, Gr. Volissos is truly a magical place. A quiet village on a hillside, dominated by castle ruines. There are 2 supermarkets and several tavernas/restaurants in the village. The house is very comfortable, exactly like on pictures. It has everything needed for a short stay. Communication with Penny was excellent, she is a very generous host. To see more of Chios, a car is needed, because the bus connection is not good. We stayed for a month and thoroughly enjoyed our stay. We can recommend the house without hesitation. Not going would be a mistake! Very beautiful and well kept. The owners are very classy people with high integrity. Very much looking forward to returning. Staying at this property was one of the highlights of our trip.